It’s a blindingly bright morning at Canyon Kitchen in Cashiers. In the garden behind the restaurant, rows of beans stretch toward the sun and curl around stalks of heirloom corn. Chef Adam Hayes reaches up to pick a pod, cradling it in his hands. These beans were foreign to Hayes when he arrived in Western North Carolina in 2009. Born in Asheboro, Hayes worked at restaurants in Charlotte and Greensboro before becoming executive chef of Grand Bohemian Hotel’s Red Stag Grill in Asheville. After a brief stint in Georgia, he moved back to WNC to take the helm at Canyon Kitchen at Lonesome Valley. 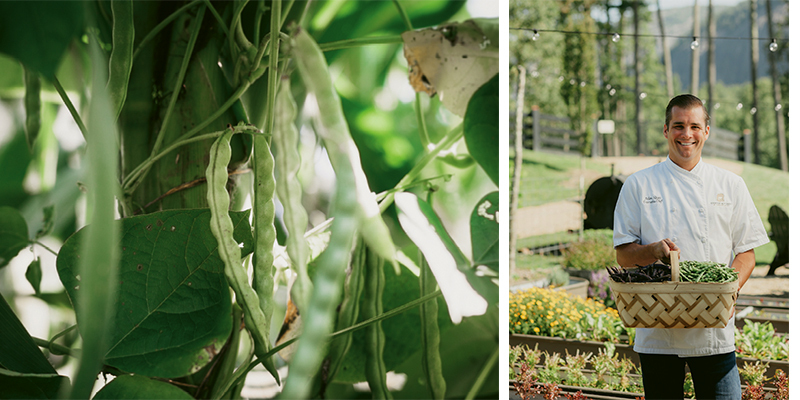 Hayes soon began exploring traditional Appalachian ingredients, including the heirloom beans growing in the garden today. “I had no idea what a greasy bean was,” he says with a grin. He quickly learned to love this Appalachian favorite, which isn’t actually greasy at all. This type of heirloom bean is smooth-skinned and fuzz-free, giving it a shiny appearance that inspired the name. There are more than 30 known varieties of greasy beans that grow in Southern Appalachia, and trading and sharing the seeds remain a common practice. Although greasy beans are labor-intensive (each pod has strings that must be removed), they are a staple on Canyon Kitchen’s summer menu. Hayes says nearly everyone on staff, from dishwashers to hostesses, has a sack of beans by their side in the summer, removing the strings during spare moments. He appreciates the versatility of beans, which can be blanched, baked, roasted, or eaten fresh. Hayes shares three recipes that highlight his favorite varieties: stringless green beans that are easy to grow, greasy beans that can be found at farmers markets in July and August, and tongue of fire beans streaked with stunning red stripes. Whether you want to keep it simple with stringless or string each greasy by hand, these recipes are perfect for a late summer meal. Picnic Favorite Baked beans always have a seat at the Southern summer table. Hayes’ recipe for baked greasy beans adds additional flair by using Benton’s bacon, sorghum molasses, and Lusty Monk mustard. Preheat oven to 350°F. Bring a large pot of salted water to boil. Add beans and blanch until tender but not mushy, about 45 minutes. Strain and set aside. In a medium sauce pot over medium-high heat, add onions and bacon. Cook for 15 minutes, stirring occasionally until bacon fat is rendered and onions are caramelized. Strain off bacon fat. Add brown sugar and molasses, allow sugar to dissolve, and then deglaze with bourbon. Add remaining ingredients and bring to a boil. Add blanched beans to sauce. Transfer to a baking dish and bake at 350°F for 35-40 minutes. Serve immediately. Crispy Cream This fresh take on a classic green bean casserole features creamy Cherokee Rose cheese and crunchy onions. Preheat oven to 350°F. Bring a large pot of salted water to boil. Blanch beans until tender, about 10-12 minutes. Strain and set aside. In a medium sauté pan, heat oil and sauté onion and garlic on medium-high until caramelized, about 10 minutes. Add white wine to pan and turn to high heat to deglaze. When wine has reduced, add cream. Reduce at medium heat for 30 minutes. Remove from heat and add cheese and mascarpone. Finish with fresh thyme and season with salt and pepper. In a large pan, melt butter and sauté mushrooms. Add green beans and sauté for three minutes. In a large bowl, mix green beans and mushroom mixture with sauce and stir to combine. Transfer to a casserole dish and bake at 350°F for 10 minutes. Garnish with fried onions. Appalachia Meets Spain Tongue of Fire shell beans, which are dry beans that require soaking, compliment the spicy punch of raw or dried chorizo in this zesty Spanish-style dish. Preheat oven to 450°F. In a large oven-safe pot, heat two tablespoons oil. Add chorizo and cook, stirring occasionally, until golden, about eight to 10 minutes. Strain in a colander to remove most of the fat and oil and set aside. Place one tablespoon oil in the same pot and cook onion and garlic on medium heat until vegetables are softened and lightly golden, about five minutes. Add tomato paste and paprika; stir constantly until paste is caramelized, about two minutes. Add chicken stock, tomatoes, chorizo, beans, one cup reserved bean broth, thyme, bay leaves, and salt. Stir to combine. Cover and bake in oven until beans are very tender and liquid is reduced and slightly thickened, 40–45 minutes. Reduce oven temperature to 350°F. In a large bowl, combine butter, breadcrumbs, salt and pepper. Place on baking sheet and bake for about eight minutes. Sprinkle breadcrumbs over beans. Bake until breadcrumbs are browned and liquid is bubbling, about 15-18 minutes. Let sit for 10 minutes. Sprinkle with chopped parsley and lemon zest just before serving.